"Having my morning cup of carrot juice! Who needs coffee when you're as energetic a piggy as me?" 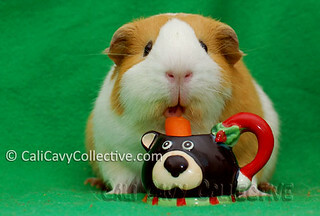 Our humans found this cute decorative mug in the shape of a bear and thought it was perfectly piggy sized. Peaches seemed to think so too. If you look closely, you'll see that the handle is actually a little Santa hat. "Showing off my goofy side, wheek!" 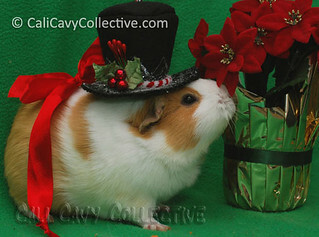 ..not to mention posing in our holiday top hat! Who says guinea pigs can't channel Fred Astaire? 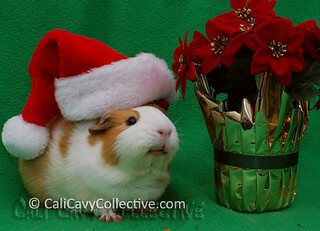 What a splendid muscular peeg. Peaches says thank you PaintedThread!